Macro Musings Blog: The Fed's Floor System: Sayonara? Sorry, but I think you have the causality here all twisted around. You seem to think that if yields go above the IOER rate, then the end of the floor system will result in a "rise in the inflation rate", because banks will not be willing to hold excess reserves, and that will somehow unleash a torrent of inflationary reserves upon the economy. But, tangibly, what will banks do if they don't want to hold excess reserves? As you mention in the footnote, they *can't* control total reserves. 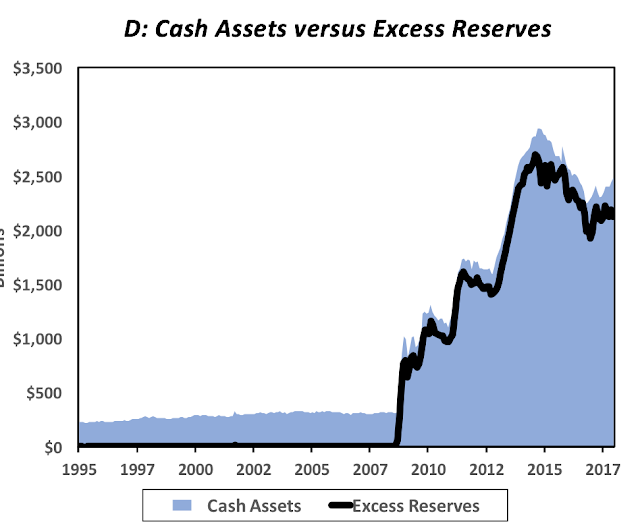 Rather, their desire to hold reserves rather than other assets determines the relative yields on those assets consistent with asset market clearing, given the exogenous quantity of total reserves. 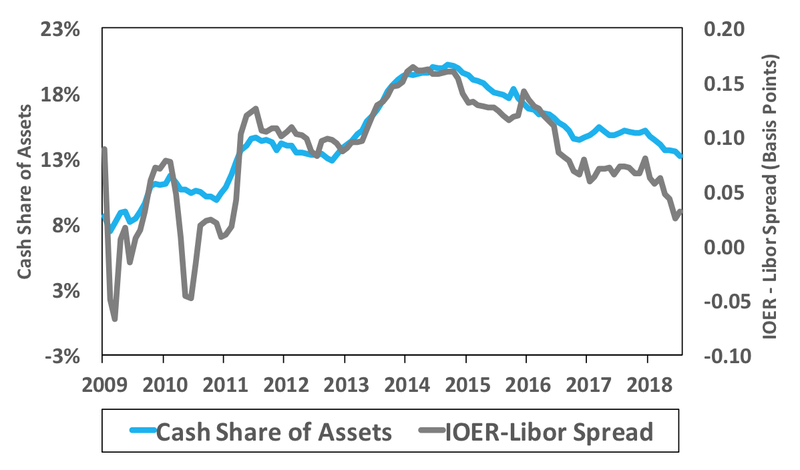 If banks are upset about holding so many reserves relative to other short-term assets, then the yields on those assets will go *down* so that the spread to IOER clears the market. In other words, the recent change we have seen will reverse itself. No crisis there! Of course as unwanted reserves are disposed of via the money market there will be a lowering of rates on money market instruments; but that effect occurs along with rather than instead of expansion in the equilibrium, nominal size of aggregate banking system liabilities. 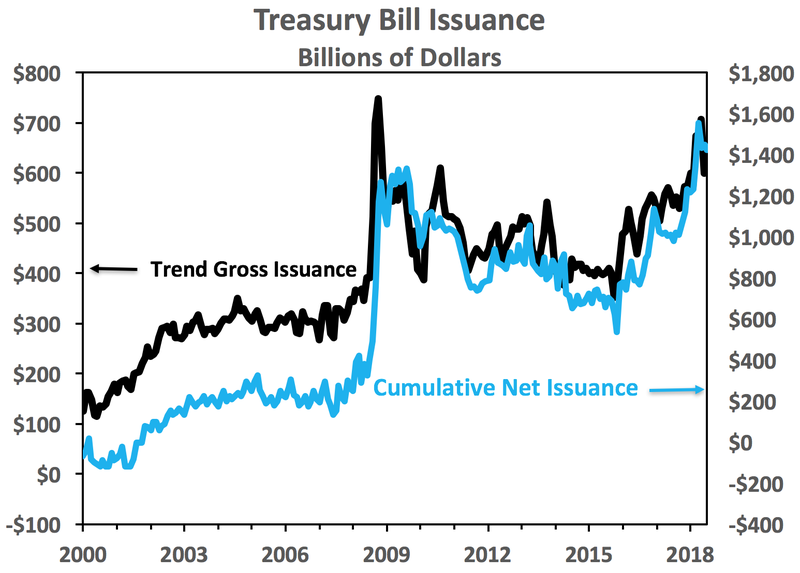 How great the expansion must be depends on the extent of the original supply-driven change in the yield on Treasury securities. In any event, growth in bank liabilities, and a consequent increase in banks' need for required reserves, plays a part in the equilibrating process. 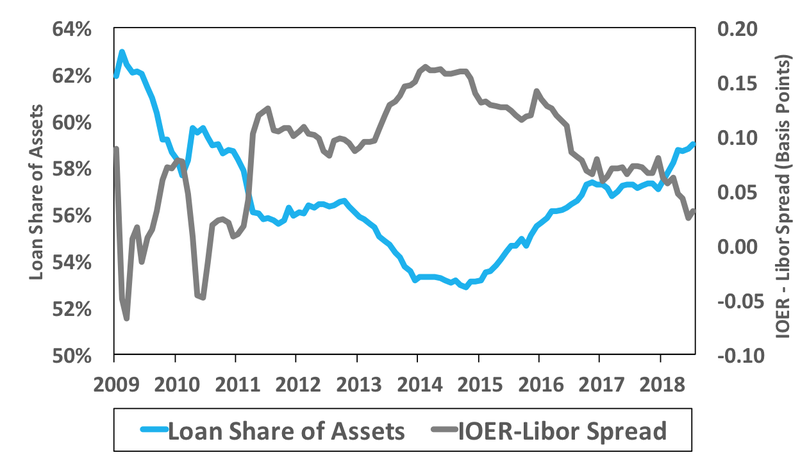 You say "If banks are upset about holding so many reserves relative to other short-term assets, then the yields on those assets will go *down* so that the spread to IOER clears the market". This assumes, among other things,that banks are a big enough player in the repo market to matter. Any evidence for this assumption? 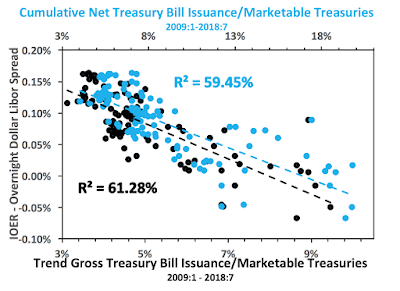 Were it the case that the long-run equilibrium adjustment following an increase in the supply of Treasuries consisted ultimately in a return of money market rates to where they started, and hence to their original relation to the Fed's rate settings, then the Treasury would be able, presumably, to borrow all it likes without ever "crowding out" other borrowers and also, ex hypothesi, without triggering inflation. So, have we stumbled upon a free lunch? I rather doubt it. George: I don't actually think that money market rates will return to where they started. 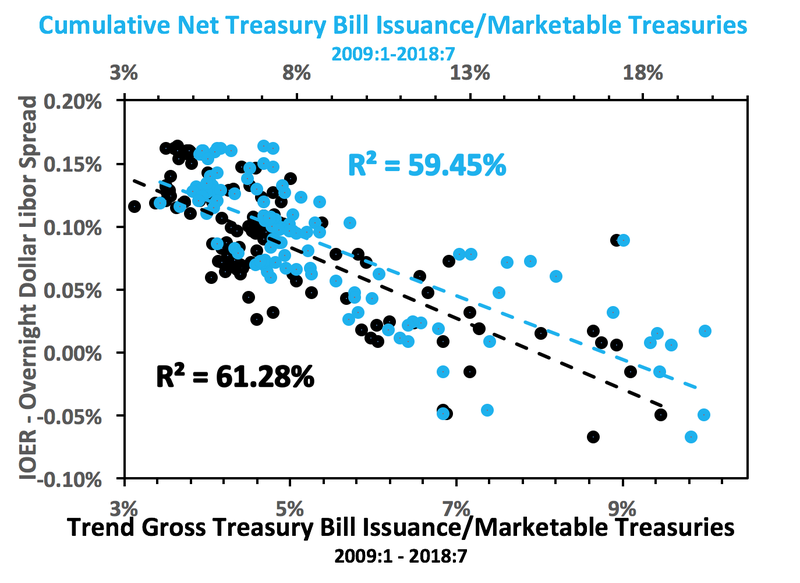 If the market is behaving normally, then an increase in the supply of T-bills relative to excess reserves will presumably push up the relative yield on T-bills, which is what we're seeing. 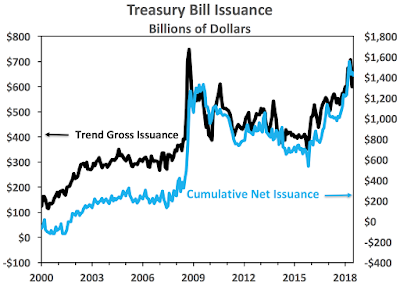 The magnitude of this equilibrium change in price will be inversely related to the elasticity of demand for reserves vs. T-bills as a function of the spread. In the post, David seems to be implying that this elasticity of demand is high - banks will try to avoid holding excess reserves now that there's no longer any yield advantage. My point is that if this elasticity is high, then the market-clearing change in spread should be small (which it evidently has not been)! In the worst case, if banks *are* really reluctant to hold excess reserves when there's no longer any reward - but they haven't fully acted out on this reluctance yet - then we'll see it in the form of lower yields on other money market assets, as banks try to exchange reserves for those assets. You seem to be worried that when this time comes, "along with" the fall in yields, we'd see some kind of explosion in lending or something (in your post you refer to a "hot potato"). 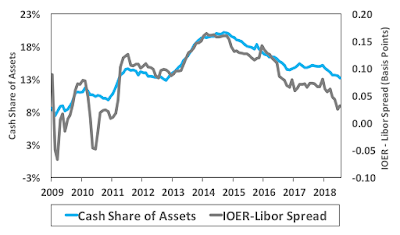 Sure, if securities yields are lower, then at the margin banks are more willing to lend - but this increased willingness is precisely captured by the change in spread. There's no immaculate transmission from excess reserves to economic outcomes that isn't accompanied by changes in yields and asset prices. The fact that many old monetarists seemed to believe in such immaculate transmission was a major cause of their epic predictive failure in thinking that the rise in base money would cause a large rise in inflation (e.g. Allan Meltzer). Well, we are not so very far apart.Being a good Wicksellian (or a Wicksellian at any rate), I reject both what you call the "immaculate transmission" alternative of some monetarists and the interests rates do it all view of...well, way too many people. Of course as banks try to rid themselves of reserves yields, having risen, fall again to "accommodate" the increased quantity of funds supplied. But as that not-so-immaculate increase makes its way through various markets, the rise in demand pushes rates up again, while growth in liabilities raises banks' required reserve needs. You can think of the story as a standard Wicksell one, were the policy rate is below the natural rate. Except while in Wicksell's version you have either hyperinflation or a policy rate that's raised to equate the higher natural rate, in the IOER case the fixed IOER rate can mean that the cumulative process continues until there are no longer any excess reserves. 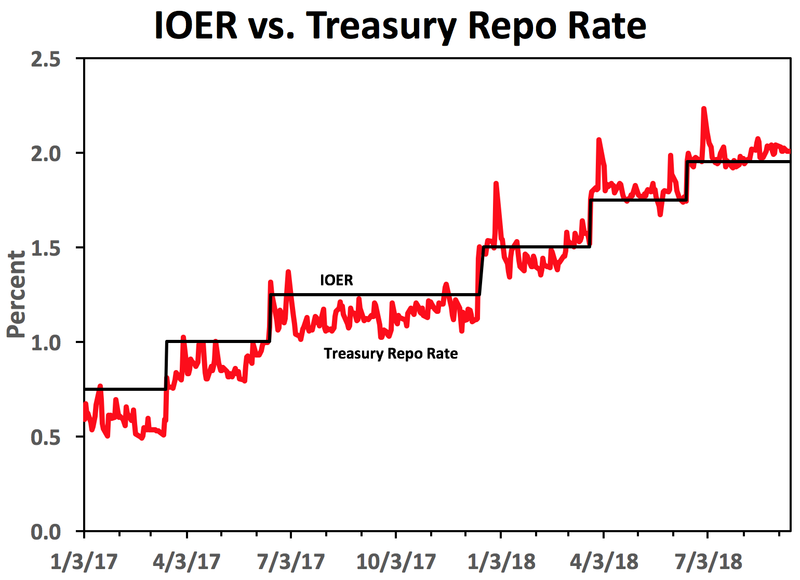 You note that if the higher yield on repos attracts banks attention, this increased demand for repos will lower the repo yield until it equals IOER rate. That is a fair point, but it assumes banks are price makers in the overnight market. It is not clear to me that they are. 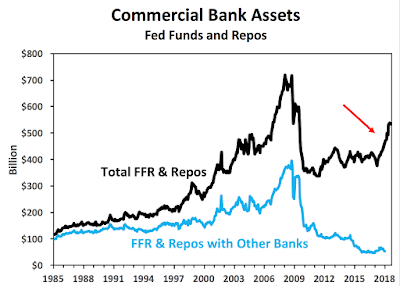 In fact, if I take the banks 'ffr and repo' measure seen in the post above and divide it by repo market as outlined in this NY Fed report (with the expansion factor updated based on an exchange with one of the authors), I get the banks share of the repo market to be about 10% for the period spanning the Fed's floor system. It is hard for me to see how your arbitrage story actually plays out with banks being a relatively small part the repo market. It seems they are more a price taker than price maker in this market. With that said, I should have been more careful with my statement on inflation. 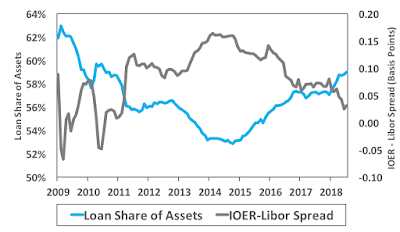 For even if my scenario unfolds, I am sure the Fed would raise the IOER (even if it meant pushing it above its natural rate level). Anon 1, okay, I am having some doubts. See my second update above. That would bring the end of the Fed's floor system and rise in the inflation rate. The above sentence seems a little cut and dried. Perhaps bank lending into real economic activity will increase. But then we may also see increases in productivity. We are seeing a rise in the value of the dollar which is lowering import prices. Or perhaps there is still slack in the economy that modern measures do not capture.